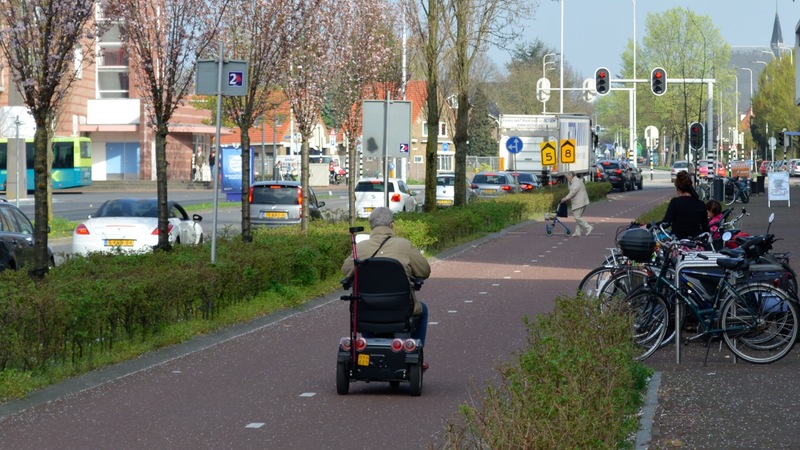 Inclusive cycling infrastructure is often described as being suitable for ‘8-80’ – for the young as well as the old. It’s a good philosophy. However, it is not quite adequate, in and of itself, to capture what’s required for infrastructure to be of a suitably high standard. For instance, a good deal of substandard infrastructure could reasonably be described as 8-80. Wibbly-wobbly crap on pavements, for instance, can be negotiated by eight year olds, as well as eighty year olds. This isn’t, however, this kind of infrastructure that many people would actually choose to use. Nonsense like this gets avoided by people who are able (although not necessarily willing) to cycle with motor traffic. So ‘8-80’ isn’t quite sufficient, in and of itself. What’s required is infrastructure that is suitable for the young and the old, as well as the fast, the confident and the experienced. Infrastructure, for instance, that’s suitable for 8-80, as well as for a team time trial. The cycle path in the picture above is one that can obviously accommodate high speed cycling, but at the same time it is also suitable for a full range of other cycling types, the slow; the young; the old. A similar version of this test was proposed by Joe Dunckley – a ‘Boris test’. That is, infrastructure has to be good enough for someone like Boris Johnson – who habitually disparages substandard off-carriageway infrastructure, while voicing his preference for mixing it with motor traffic on busy roads – to choose to use it, rather than opting for the motor traffic alternative. We know from looking at the systems of cycling infrastructure in the most successful cycling nations and cities that they design one network for cyclists, and only one, to one set of standards. They treat cycling as we treat motoring and walking, that is, as an essentially homogeneous activity facilitated on one network, built to one set of standards, for all those who do it. They recognise that cyclists, whether they be young or old, fast or slow, able-bodied or disabled, all need essentially the same things, in terms of a quality network that gives priority, directness, and both actual and subjective safety. There is no question of us having a network of roads for “less confident drivers” and a different one for “fast and advanced motorists”, and this is how the places that get cycling right also treat cycling. They build cycle lanes, paths and tracks that work of all types of cyclists and all abilities at the same time, and have sufficient capacity to cope with all, taking the attitude that if it’s not safe enough for young children, it won’t be safe enough for anyone, and if it’s not convenient enough for commuters in a hurry, it won’t be an attractive option to anyone. They build up to a common standard that works for all, and don’t say “If you don’t like it, there’s always the busy, dangerous main road”. Uniformity of provision is tremendously important, because its alternative – dual provision – essentially involves designing for failure. Dual provision means building something that, at the design stage, it is already accepted that people will not use. It involves building, for instance, shared use pavements that the designer knows will be avoided by people who prefer to cycle on the carriageway, because the shared use pavement is too inconvenient, awkward, or slow. 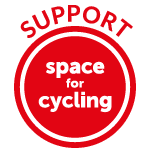 Equally, it involves catering for people on the carriageway while acknowledging that many people simply won’t want to use that same carriageway because it is too intimidating, or hostile. We still continue to build infrastructure according to this failed philosophy, at tremendous cost. Accommodating fast cycling doesn’t mean ignoring the needs of the slow, or the less confident, or the nervous. In fact, quite the opposite – cycling infrastructure designed for speed means more convenience for everyone. It means an absence of sharp corners, of barriers, of ‘shared use’ in appropriate circumstances, of pedestrian-specific design in general. If it’s good enough to ride a bicycle fast on it, then it will undoubtedly carry benefits for slower users, even those who are not on bicycles. That’s why aiming for 8-80, although admirable, isn’t good enough by itself. It needs to be good enough for everyone to want to use it. You reference mobility vehicles at the end of your post, I think that in the urban realm these will be the saviour of Britain’s fractured cycle lobby. These vehicles are too fast for the pavement yet too slow for the road, very much like bicycles. The elderly turnout to vote and I can see the likes of Pickles agreeing to segregation for mobility vehicles, electric assisted bikes etc to gain those votes. Perhaps instead of “8-80” we use “AAA” – “All Abilities Anywhere”. To be pedantic I take 8-80 meaning every age between 8 and 80 ; and that includes sporty Mamils. When I commute I ride a track bike set up for the road, and I ride fast. I’m more than capable of holding my position in moving traffic. I’ll be in lycra and wearing a helmet. When I come hack from the shops I’ll be riding a fully-loaded utility bike, not particularly quickly. I’ll be in normal clothes and without a helmet. I should not be put into a dangerous environment for either. Infrastructure should be built for ME, not my choice of bike. Perhaps we just need to re-punctuate the 8 — 80 phrase: “from 0.8 to 80 mph”! What about 5 to 105 doing 3 to 23? 5 years old to 105 years old doing anywhere from 3 mph to 23 mph? I’m sure some people will go faster, but that covers a very wide range of skill levels and speeds. The Giro TTT in the photo could be doing double that — but of course, they have a closed road (or path), so that’s rather different. Which does beg the question, what should be the design speed and useage of cycle paths? Because there has to be one (for new infrastructure at least), even if it’s so high we don’t notice it. Current UK guidance is 20mph. It’s almost never delivered. Making that mandatory would be a start. As there are no actual design standards at all, the question is somewhat moot. I’d suggest 25mph as a suitable minimum ‘designed for’ speed – not many people will top that on the flat over any great distance, and it’s nice in metric too! There’s certainly no point in planning for a speed that plenty of people can ride at for a long time, so 20mph would be too low. Any lower than ‘fast roadie’ and you create a duel network. This is a good question and for the whole of the UK it might depend on path gradients (more variable than most of the Netherlands) and junction geometries. On flattish straights, though, where most cycling would be expected to take place, it might mean designing widths, curves and, at least as important, forgiving path margins, for a safe overtake at a potential >40+ kph differential [<10 kph (little kid) – 50 kph (Wiggo (or Laurens ten Dam or the AG2R team) training)]. But are bromfietsen going to be banned from our brave new cycle paths? I think current UK design standard is 12mph. In practice this is meaningless, but if it were possible to ride at a constant 12mph on all UK infrastructure, I suggest it would still be inadequate. The range of speeds at which people cycle is far greater than the range of speeds at which people usually drive. Some cyclists never reach 12mph, for others it is hardly moving. Perhaps what would be more useful than some ‘design speed’ would be — as Jitensha and others mention — generous radii, sightlines and (what the UK is very bad at) lack of obstacles. I’m thinking of the “silly Sustrans gate” (often the work of local authorities, but we love a bit of onomatopoeia). Where are you getting 12mph from? Section 8.2 of the much-detested Cycle Infrastructure Design (LTN2/08) sets out 20mph. I’d agree that most highway authorities do less than two-thirds of that but that’s substandard. Probably from a misremembered a hearsay version of that doc — I did say “I think”! And I note 12mph is given as design speed for Local access routes in Table 8.1 on p42. In any case, the text describes those design speeds as “preferred” (section 8.2.2) so I don’t know if they have any force. Sadly. No, none of it has any force. It is merely guidance and I am not sure if it has ever been followed completely for any UK cycleway since it was published in 2008. Also traffic volumes. That path in San Remo would be no good for a TT if it was full of commuters and pootlers. Which is why it’s closed for the Giro. Crowded cycle paths are just as inappropriate for chain gangs as city streets are. 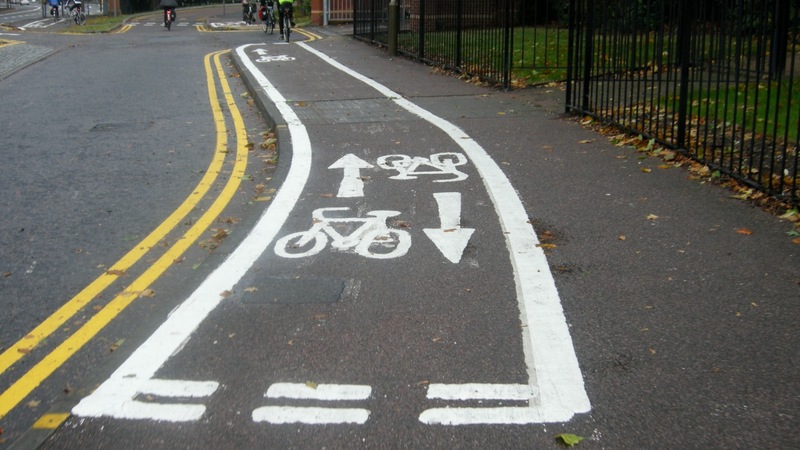 I often don’t ride in cycle paths because they’re not fit for purpose – but those that are, do get used. The paths that involve stopping at each junction as they cross over the road every 50 metres are ridiculous, as are the ASLs at the traffic lights that encourage people to go up the inside left of vehicles. should be taken notice of by LAs etc, too. If only! Even “our own” cycle orgs love to scatter tandem traps — or pannier blockers — on their paths. Chapter 3 of the revised London cycle design standards has a page with ‘non-standard’ bikes and their dimensions – one of the most useful pieces of design information I’ve come across recently. “The Department for Transport, is compiling a set of Case Studies that exemplify high quality, high performing cycle infrastructure in the UK. The DfT are requesting recommendations of good on-highway cycle solutions that they can publish as Case Studies. They are particularly interested in on-highway cycle solutions, rather than cycle facilities located away from the highway (except where a highway project derives part of its success from them). Well that’s easy: in 30+ years of riding, I think I’ve yet to ride a route alongside/on a UK highway that doesn’t fail by substandard width, lethal layouts at junctions or poor maintenance. Have you? Just to clarify – there are a few good routes, but they’re away from highways. If there’s a highway nearby, it gets preference and it seems it’s always the cycleway that gets squeezed/compromised. Chartered Institution of Highways and Transportation – they regularly email a news letter to members. Katie is 8 years old. She likes going faster than the adults walking, and stopping to look at things. Her mum and dad want her to be safe on her way to school. Katie is 18. She wants to get to school quickly when she’s had a lie-in, and isn’t very awake yet. On her way home, she wants to cycle along with her friends chatting, not be shouting over engines or pausing repeatedly whilst they let cars past. Katie is 28. She wants to get to client meetings quickly and efficiently, but arrive looking professional. She wants to be thinking about her clients on the way, not the traffic! Katie is 38. She has small children in her cargo bike, or large amounts of shopping. She wants them to be safe and not scared, and she never wants to have to lift her bike up or squeeze through small gaps. Katie is 48. She’s decided to cycle for fun and exercise – she wants to be able to train near her house the same way she jogs near her house: safely and conveniently. She doesn’t want to have to stop every couple of minutes. Katie is 58. She and her husband are taking long weekends to travel around the UK. They want to travel between villages, towns and cities without having to plan the route carefully. They want to take their bikes on the trains, or leave them securely at stations and airports for a week or two. Katie is 68. She still does all of her weekly shopping by bike. She wants places to park it very close to the shops, so she doesn’t have to carry her shopping too far. Katie is 78. She has a mobility scooter, which goes about as fast as her old bike. She doesn’t want to ride it in the road with the traffic, or on the pavement with the slow pedestrians and bumps. She can’t walk far, or drive, but she still wants to be independently mobile.